Between 18-21 September 2018, in the town of Stawiszcze (Łódź voivodship) 16 national organizational and training workshops of the Polish FADN took place as well as the research task “Analysis of changes in the profitability of production of selected agricultural products” Multiannual Program 2015-2019, organized by the Polish Liaison Agency for FADN. The workshop was attended by representatives of 16 agricultural advisory centers and employees of the Institute of Agricultural and Food Economics – National Research Institute (IERiGŻ-PIB). As part of organizational and training workshops, presentations were given by employees of the Agricultural Accounting Department of IERiGŻ-PIB and invited guests. 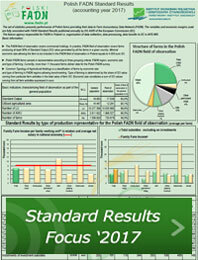 Issues related to substantive issues and the implementation of the Polish FADN task, the subject and organization of research conducted in the AGROKOSZTY system were discussed, selected agricultural markets in Poland related to poultry, pork, milk, fruit and vegetables were characterized, and the farms were balanced in the light of FADN data. Finally, the challenges for the Polish FADN are presented from the perspective of regional coordinators.